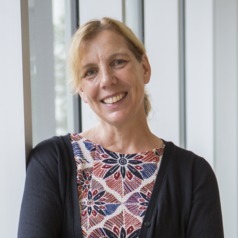 Dr. Sara Kirk is a Professor of Health Promotion and the Scientific Director of the Healthy Populations Institute (HPI) at Dalhousie University in Halifax, Canada. She also holds adjunct status with the IWK Health Centre and Mount Saint Vincent University, Halifax. Her research uses a ‘socio-ecological’ approach that takes into account how individual behaviours are influenced by other broader factors, such as income, education and societal norms. This approach takes into account the interaction between an individual and their environment. While the widely held belief of personal choice and responsibility remains at the core of approaches toward population health and disease prevention, it is glaringly evident that these choices are no longer made within the context of a neutral environment. Instead, a range of influences, such as the media, marketing, economic and urban development, have constructed countless social, economic, political and physical barriers, which actively discourage people from doing the very things we require of them to achieve good health. Dr. Kirk’s research promotes understanding and application of health research through collaborations with a wide range of partners, including Government, health authorities, municipalities and citizen stakeholders.